On his arrival in Petrograd he immediately got down to formulating what exactly his party had to do to speed up the socialist revolution. In a condensed form his ideas first appeared in his celebrated April Theses, published in the Bolshevik newspaper Pravda under the title ‘The Tasks of the Proletariat in the Present Revolution’ and then elaborated in other articles written in the spring of 1917. 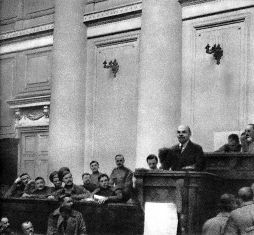 In the April Theses, Lenin advocated the overthrow of the Provisional Government by the Soviets. To achieve this, he offered a program designed to gain the support of the masses, secure the Bolshevik majority in the Petrograd Soviet, undermine the authority of the Provisional Government and, ultimately, transfer all power from it to the Soviet. This was an outline of the strategy which, within seven months, was to bring the Bolsheviks to power. On the issue of war, Lenin rejected the Provisional Government’s slogan of ‘revolutionary defensism’ arguing that under the new government the war on Russia’s part remained ‘a predatory imperialist war owing to the capitalist nature of this government’. He called upon his party members to organize the widespread propaganda among the army of the view that it was impossible to end the war by a truly democratic peace without the overthrow of the capitalist ministry. In the Theses Lenin underscored his idea of merging the two stages of the revolution into one by insisting that in February Russia had entered ‘a transition from the first stage of the revolution, which, owing to the insufficient class consciousness and organization of the proletariat, led to the assumption of power by the bourgeoisie - to the second stage, which must place power in the hands of the proletariat and the poor strata of the peasantry’. Such transition was made easier by the Provisional Government’s reluctance to use violence in relation to the masses. The new liberal government consciously sought to create the conditions of a maximum freedom for its citizens (on Lenin’s own admission, ‘Russia is now the freest of all the belligerent countries in the world’). This gave the revolutionaries a unique opportunity to accomplish the transition from the bourgeois revolution to the socialist revolution by peaceful means. In order to achieve the establishment of a working-class government, the Bolsheviks should, first, renounce any support to the Provisional Government and, second, step up the propaganda campaign portraying the majority bloc of moderate socialists in the Soviets as being under the ‘influence of the bourgeoisie and the conveyors of its influence to the proletariat’. By criticizing the mild and conciliatory stance of the Soviets, the Bolsheviks would increase their own influence in them and, as soon as they had secured a majority, they would declare the transfer of the entire government power to the Soviets of Workers’ Deputies. Lenin emphasized that the Soviets were the ‘only possible form of revolutionary government’. In his April Theses he vehemently castigated the idea of a parliamentary system, insisting that what Russia needed was: ‘Not a parliamentary republic - to return to a parliamentary republic from the Soviets of Workers’ Deputies would be a retrograde step - but a republic of Soviets of Workers’ and Peasants’ Deputies throughout the country, from top to bottom’. Lenin understood that the Bolsheviks stood little chance of becoming a ruling party as a result of the planned elections to the Constituent Assembly. They had, however, a very good chance of coming to power by seizing control of the Soviets. Despite the unquestionable respect which he commanded in his party, Lenin had to use all his powers of persuasion to get the Bolshevik leaders to accept this radical program. However, many rank-and-file party members from the working class shared Lenin’s outlook and gave support to his arguments in party committees, with a result that a party conference early in May adopted the April Theses as official party policy. This decision distinguished the Bolsheviks from all the other socialist parties, for they were now the only political force committed to the creation of a working-class government. The decision to overthrow the Provisional Government also meant that the Bolsheviks had no need to compromise with the ‘bourgeoisie’ and court Russia’s upper classes. They could now concentrate on building up a working-class and soldiers’ support by offering the masses a simple but attractive program: an end to the war, land to the peasants, bread to the hungry, freedom to the empire’s oppressed nationalities. Whether they could satisfy these demands was an altogether different matter. The party’s commitment to revolution also meant that Bolsheviks now had a sense of purpose which the moderate socialists lacked.